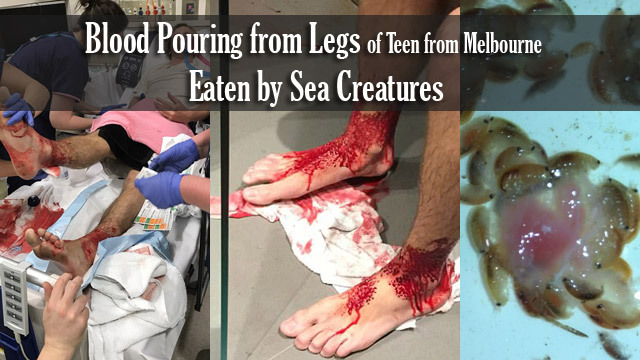 Shocking images of Sam Kanizay’s inexplicable injuries on his legs and feet was broadcast around the world that was possibly cause by sea creatures. After playing a tough football game, he decided to soak his legs at Brighton’s Dendy Street Beach to cool his sore muscles but when he came out of the water; both of his legs were bleeding. The 16 year old teenager said that he tremble when he was in the water and his 1st instinct was he may just step on a rock. When he raised his legs, he wipes the blood but it wouldn’t stop bleeding. Doctors were puzzled to solve the mystery so Jarrod Kanizay, Sam’s father, decided to investigate on his own. He went back to the beach and collects hundreds of creatures that were responsible on his son’s wounds. When Mr. Kanizay was interviewed by the media, he told them that he put fresh meat on the net till the mite type creatures will grabbed on it like there’s no tomorrow. It is clear that these bugs really love meat and it’s been taken to the hospital for a series of test to determine the species. Marine Biologist Genefor Walker-Smith inspected the samples and found out that these were rummage crustacean known as lysianassid amphipods. She said it’s possible that the bugs contain anti-coagulant that is similar to the leeches produced. While these creatures are not poisonous and has no lasting damage, Sam is still at Dandenong Hospital unable to work. Meanwhile, Monash University’s Associate Professor is confident that Sam’s bites were cause by Sea flares. It is very common in waters but had a theory that these were hanging around at Brighton on the weekend. Sam’s injuries may look bad in the photos but it’s just an ostensible injury and he will recover quickly. Despite the horrific incident, locals were not bothered in going back to Brighton beach and swimmers insist that they don’t experience anything like it.